The U.S. Export-Import Bank (Ex-Im) is financing the purchase of solar panels from a manufacturer now owned by the Chinese that had previously attracted investments from prominent Democrats, the bank announced Wednesday. The deal comes amid criticism of the bank’s support of foreign competition to American businesses and accusations of cronyism. Ex-Im approved a loan to an Indian developer who wants to buy solar panels from MiaSolé, a California-based solar panel manufacturer. A bank spokesman said the loan amount has not been issued yet, as the financing terms are still under negotiation. The private Chinese energy firm Hanergy bought the struggling MiaSolé late last year. MiaSolé’s board first sought $1.2 billion, but Hanergy paid only one-tenth of that, the New York Times reported. MiaSolé has developed a "thin film" solar panel that uses a unique chemical compound to capture energy more efficiently. Hanergy indicated it would make panels using MiaSolé’s technology in a plant in China in addition to continuing MiaSolé’s California operations, the Times wrote. President Barack Obama has pledged to compete with the Chinese for markets in green energy technology. "As long as countries like China keep going all-in on clean energy, so must we," the president said in his 2013 State of the Union address. Hanergy’s acquisition of MiaSolé brings it into direct competition with American thin film solar panel manufacturers such as First Solar, one of the biggest manufacturers of thin-film solar panels, and Solopower. A First Solar spokesman declined to comment for this article. SoloPower could not be reached for comment. Ex-Im has come under fire in the past for supporting foreign competitors to American businesses, most recently in last year’s legislative fight over the bank’s reauthorization. An Indian competitor of Delta Airlines bought Boeing airplanes with financing help from Ex-Im, leading Delta to campaign against the bank’s reauthorization on the grounds that it was helping its competitors. Delta claimed to have to drop its direct flight from New York to Mumbai because it could not compete with the Indian airline’s prices. Congress reauthorized the bank but only under the stipulation that the treasury secretary begins to negotiate with foreign countries to reduce finance subsidies. An Ex-Im spokesman said the ownership of the manufacturing company does not factor into the bank’s decision to offer financing. "The ownership of the company is not relevant to the decision to approve financing; the export products or services for which Ex-Im provides financing, however, must be produced and exported by U.S. workers," Ex-Im spokesman Phil Cogan wrote in an email. He noted that Ex-Im supports the export of many companies who are manufacturing in the United States but not owned by Americans. While MiaSolé and Ex-Im announced the financing and sale only recently, the deal appears to have been finalized well before Hanergy acquired the California manufacturer. A source close to the company indicated that MiaSolé’s export sale to the Indian company was finalized in June 2012, with the panels shipped in July and August. 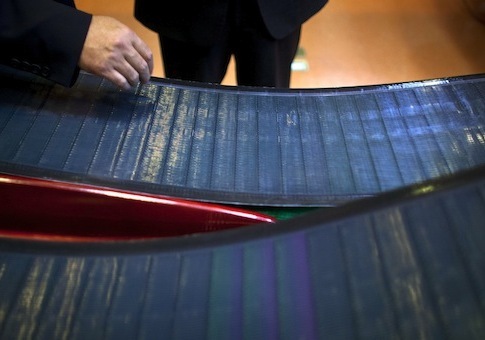 Hanergy committed to the acquisition in September 2012 and the buy was finalized in December, the Times reported. Before Hanergy bought it, MiaSolé had attracted investments from the politically connected firm Kleiner Perkins. Failed presidential candidate Al Gore and former presidential adviser John Doerr are partners at Kleiner Perkins. Doerr is listed as Kleiner Perkins’s managing partner for MiaSolé. The Times reported that MiaSolé’s investors—primarily venture firms like Kleiner Perkins—invested more than $550 million in the firm. It is unclear what, if any, role they have with the company after Hanergy’s purchase. Doerr’s office said he was unavailable for comment because he was traveling outside of the country. Ex-Im president and board chairman Fred Hochberg is a prolific Democratic donor and Obama bundler. The board would not have directly approved the loan in support of MiaSolé and Hanergy because the board only reviews and approves financing over $10 million. The loan in this case was $9 million dollars. This loan is not the first time that MiaSolé’s customers have received assistance from the federal government. Another Indian buyer of its panels received a $3.7 million dollar loan from the Ex-Im in 2010. Ex-Im’s charter mandates that the bank support American jobs by supporting American-made exports through financing. While the banks ultimately backs the financing it offers with the "full faith and credit of the U.S. Government," Cogan emphasized that the bank has a loss rate far below most private institutions, and it uses revenue to cover the losses it does incur. Ex-Im’s charter further mandates that the bank not displace the private financing market, and the bank determines if it the applicants for its financing actually need government-backed financing. MiaSolé and Hanergy’s fortunes may be looking up, however. MiaSolé recently announced that it planned to double the employment at its Santa Clara location by hiring 200 people. Ex-Im’s announcement attributed the company’s growth to its "growing export business." This entry was posted in National Security and tagged China, Cronyism, Ex-Im Bank, Loan, Obama Administration. Bookmark the permalink.